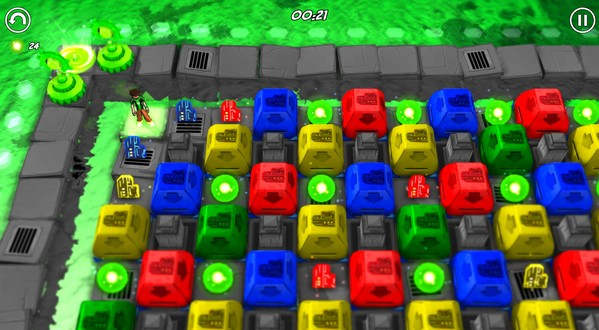 Ben 10 Game Generator 5D is an overhead puzzle game that has you playing as Ben Tennyson from the Ben 10 animated series. 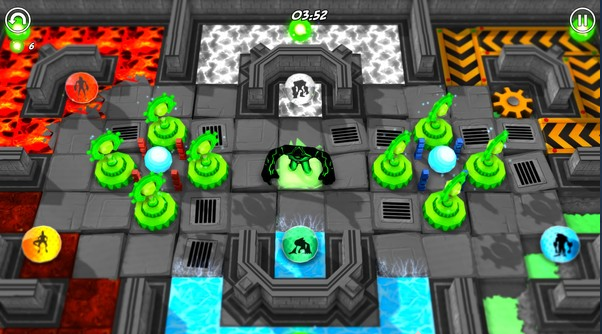 The goal of the game is to get to the exit but there are puzzles and obstacles blocking your way from doing so, you'll have to use your brain to get past them. Ben also has the ability to transform into different aliens (yes, just like in the show) and you'll need to turn into a certain form for if you need to cross a certain terrain such as: Fire, Water, and to push against conveyor belts. This game sounds very simple and a bit on the boring side but hold that thought, this game might surprise you. (Click on "Read More" to read the full review). You'd think that with an action packed license such as Ben 10, would include a story about solving puzzles to stop an evil villain, however there is no story at all with this game and it would've been nice to see an opening and closing cut-scene at the very least. Thankfully, the gameplay is strong enough to hold the game together (as you'd expect from a video game) and the concept is simple but is surprisingly fun. Trying to solve the puzzles and find your way out was very interesting due how you'll need to use your head and think about how to solve the puzzles and the designs of the puzzles as well. If you grew up playing Chip's Challenge (1989), Chip's Challenge 2 (1999) or played the more recent Chuck's Challenge 3D (2012), you'll find this game to be very familiar as this game plays exactly like the games I had mentioned. This doesn't surprise me, this game was done by the same people that did those games. With that all said, I've got a little question for them: Why choose "Ben 10 Game Generator 5D" as the official name of the game? I can understand for if it wasn't up to them to choose the title but wouldn't the title, Ben 10: Ben's Challenge been a more appropriate title? The title is very misleading and very off-putting and this is my biggest complaint with the game. If you haven't grown up with Chip's Challenge, let me explain to you for what you can expect from trying to solve puzzles in this game. 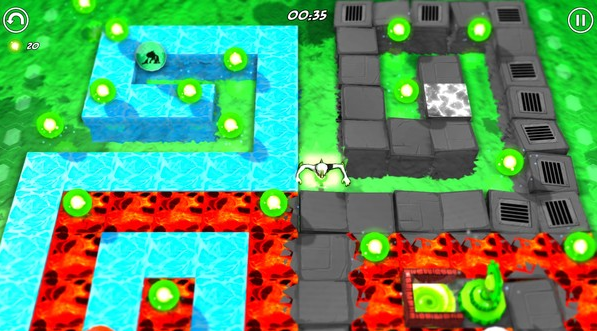 Each level has different goals and those goals will require you to sometimes collect green gloops to unlock a certain door, collect colored keys to open up colored blocks, move blocks onto buttons to open doors, pushing blocks into water to make paths, and to blow up certain items that are blocking your way. While this might sound like a boring mish-mash shovel ware title, it is actually quite fun trying to solve all these puzzles and I got much deeper into the game than expected and had a good time along the way. This game has fifty levels and this will give you a good half-day to a day to complete depending on how fast you figure the game out. The difficulty isn't that high, these puzzles were designed with kids in mind but there were some puzzles that were challenging and a bit too hard for its target audience, heck, some were even nearly too hard for me. It wasn't until after the game that I found out that there is an option that tells you how to solve the puzzle but where's the fun in that? 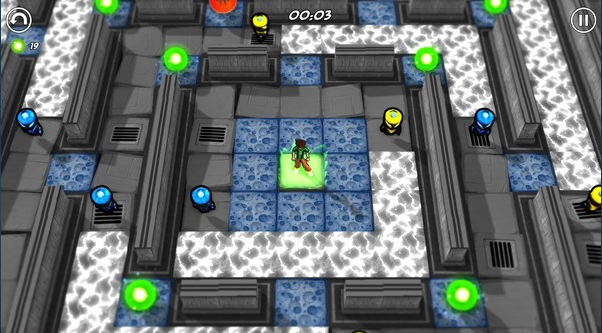 This game also has a very neat level creator that has everything that you'll need to create puzzles of your very own. Once you've made a level, you can publish it as a download for everyone else to play or you can download other players levels yourself. Level design in this game is mostly really good, there are some well designed levels and even remakes of old levels from Chip's Challenge and Chip's Challenge 2 (1999). There were also a few really dodgy designed levels that were not fun to play on what so ever, the worst level was funny enough the first level in the game. The problem with the first level is due to the solution of the puzzle, it was a very poor design choice and this is especially bad as it'll make you think twice about playing this game. Once you've gotten over that first hump, it is mostly nothing but good from there. Controls are incredibly simple and they are also very responsive, so you won't have any trouble moving Ben around in the game. If you make a mistake in this game then you can hit a rewind button that will rewind you back until you have reached a point in your run to where you are comfortable with trying again, you can also restart the level if things get too rough. The user interface in the menus could've been a little tighter, making a menu selection can sometimes be frustrating as the reactions can get very laggy. I've also had a problem on where I've clicked on a level and it took me to a completely different level. I have also had a problem with the "Play Next Level" button as instead of it taking me to the next level, it restarted the same level I was just on and this has happened more times than I'd like for it to happen. Graphics in this game are very basic and the player models could've been a bit better, they looked a bit dated. The graphics for the levels are also on the average side but you can tell what everything is supposed to be, so you won't get confused about what everything is supposed to be. Animation and movement is very decent, the movement is smooth and responsive, however the swimming animations looks a little weird due to the way that the model is connected to the water. Music in this game is on the generic side of things, granted it is not terrible music but it doesn't suit the game all that well. Yes, the Ben 10 theme does appear in the main menu but it can get very annoying to listen to as it is repeated over and over again. Overall, this game was good, not great, it has fun and interesting levels that will keep you entertained. Sadly, as fun as it way I'm only recommending this to two groups of people: Kids, and fans of Chip's/Chuck's Challenge that want more levels to play. Is this game good enough to get your kids into the Chip's Challenge series? Well, maybe not for Chip's Challenge as the dated look won't appeal to kids but this will get them into playing Chuck's Challenge 3D for sure as it shares a similar look and feel to this one. Great for the kids.